With my New Year New Me perspective on diet (for like the fifth year in a row) I am taking this lifestyle change incredibly seriously as compared to years past. I can manage to follow all of the rules of a healthy lifestyle except I struggle with giving up my sweets. There is just something so satisfying about fulfilling that late night craving for something sweet and even better if it is chocolatey. Since I know I am not the only one out there who made some New Year’s fitness resolutions I thought I would share with you one of my first attempts at taking ordinary recipes and making them “skinnier” to fit my cravings but also not shatter my progress toward my goals. I decided to attack carrot cake because it is a quite deceiving dessert. You would think that since carrots are so good for you they would naturally make a little bit healthier of a dessert compared to others but it is quite the opposite. Each slice could run you on average 500 calories. That is devastating to any healthy lifestyle. What is also devastating is the way some recipes try to slim down carrot cake. The most vile of substitutes to traditional ingredients were soy flour, flax-seed meal, and tofu just to name a few. 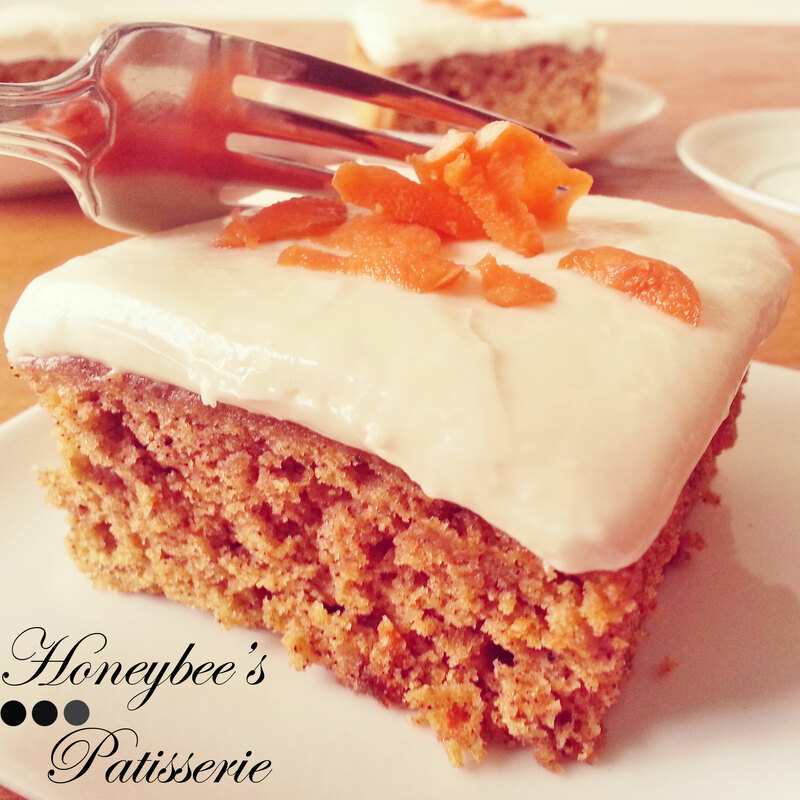 So how to make carrot cake retain its traditional flavor, moisture, and most especially frosting without adding the pounds. There are a few good tricks out there that aren’t as strange as straining prunes and mixing them with oil just to give moisture. First be sure not to overload the batter with too many shredded carrots. You would think this would be beneficial and add flavor but it just weighs the cake down and affects the texture. Not to mention I despise shredding carrots and the less I to shred the better. But without as many shredded carrots in the batter the carrot flavor isn’t as pronounced. This is when having a baby in the house that hates carrots is beneficial. 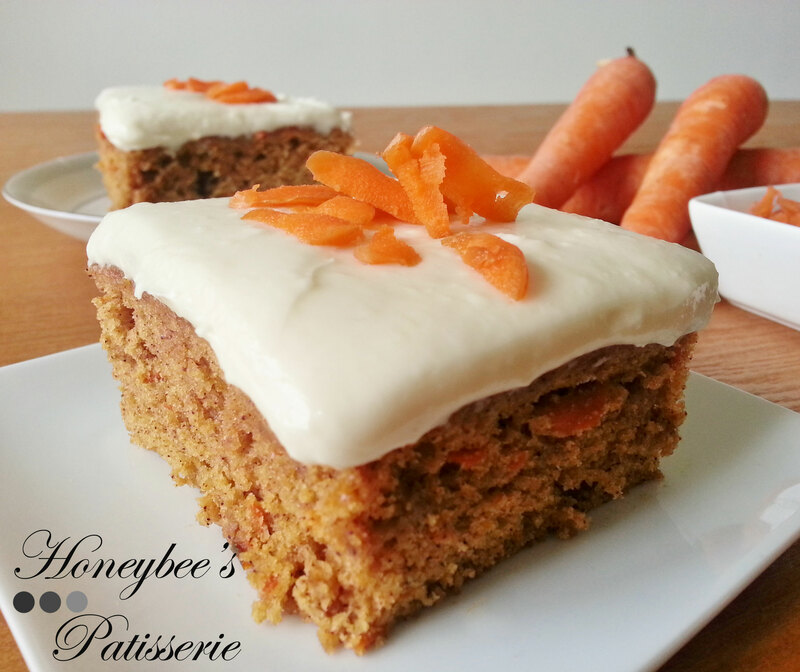 Just one jar of organic baby carrots I had lying around is all the cake needed to have proper flavor and moist texture without adding unnecessary or crazy additives. With the cake pretty easy to make skinny the tough job would be the frosting. Everyone knows you can not have a carrot cake without that thick luscious layer of Cream Cheese Frosting. Problem is Cream Cheese frosting is a scale tipper. To make the Cream Cheese frosting resemble traditional full fat flavor without the pounds of fattening butter there is a sneaky secret ingredient… marshmallow creme. Marshmallow creme, like Kraft Jet Puffed or Fluff, gives the proper flavor and texture while eliminating the need for butter and allowing us to lessen the amount of sugar. The best part of this secret ingredient is that you can fool people with the thick and rich frosting it creates and they will never know it contains no additional fat. Pair the secret ingredient with cream cheese that contains 1/3 less fat, such as Neuchâtel and you have a skinny frosting. Note: Although I recommend using Neuchâtel cream cheese, any cream cheese labeled as being 1/3 less fat will work in this recipe. Be sure when you are looking for the marshmallow creme that you don’t accidentally mistake it for marshmallow sauce which will result in a runny frosting. When shredding the carrots, use a box grater and shred on the large holes side. Alternatively, you could use a food processor with a shredding disk if you have one. When buying a jar of baby carrots, be sure that the ingredients only list carrots and water. With any skinny option, be sure that you consume only in moderation. Making this a recurrent part of your diet will not allow you to lose or maintain weight. 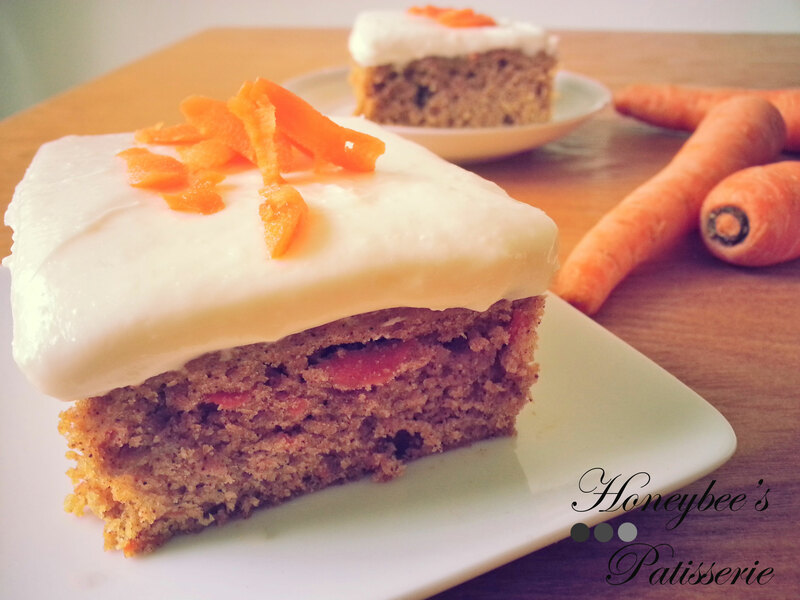 Traditional Carrot Cake contains on average 500 calories, 33 grams of fat, and 8 grams of saturated fat. 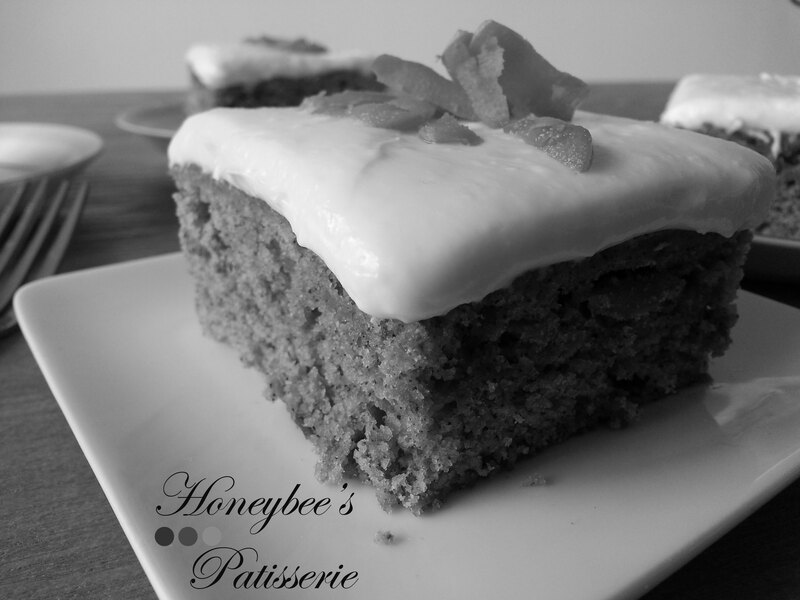 Skinny Carrot Cake with Cream Cheese Frosting contains approximately 280 calories, 11 grams of fat, and 3 grams of saturated fat. Heat oven to 350°. Lightly grease a 13×9 inch baking pan with cooking spray and line the bottom of the pan with parchment paper. Mix the flour, baking powder, baking soda, cinnamon, nutmeg, cloves, and salt together in a large bowl. With a stand mixer on medium speed, beat eggs, baby carrots, and sugar together until smooth and creamy, about 1 to 2 minutes. With the mixer still running on medium speed, slowly add the oil and mix until thoroughly incorporated. Reduce the speed to low and add the flour mixture in two additions, scraping down the sides of the bowl between each addition. Mix until the batter is nearly smooth. Fold in the shredded carrots by hand with a rubber spatula. Spread the batter in the prepared cake pan and bake until a toothpick inserted into the center of the cake comes out with a few moist crumbs, about 24 to 28 minutes. Cool the cake in the pan for 10 minutes then invert onto a wire cooling rack. Remove the parchment from the bottom and flip cake right-side up again to cool completely, at least 1 ½ hours. To make the frosting, use a stand mixer set to medium-high speed and beat the cream cheese, marshmallow creme, and vanilla together. Add the sifted confectioners’ sugar and beat on low-speed until mixture is smooth. Frost the cooled cake and serve.